My recent post about teardrop campers has had me thinking about camping. When I was a kid there was nothing better than “camping” out in the back yard in the summer. For several years my tent of choice was a little orange pup tent which was a lot of fun. However, I can’t tell you how much I wish I had the option of tent from FieldCandy back then. FieldCandy offers a line of “designer” camping tents that are just about the coolest things ever to hit the camping world. 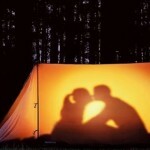 The designs offered by FieldCandy include designs like this kissing couple, as well as tents that mock a slice or cheese or watermelon, or a quilt or circus tent. I defy you to go to FieldCandy and not be charmed and/or inspired by their cool tent designs. See all the tent designs of FieldCandy here. Lost Cowboy is powered by	WordPress 5.0.4 and delivered to you in 0.797 seconds using 45 queries.